Far North Qld rainforest & tropical flowers allows bees to produce high quality honey. Because honey bees CANNOT & DO NOT transfer the multitude of Moringa vitamins, enzymes & other nutrients into their honey, there is a powerful need to use herbal infusion to enable high transfers of Moringa nutrients. To ENSURE Exceedingly high levels of Moringa nutrients in our honey, we infuse our raw honeys with our Moringa flowers, nectar, baby 'drumstick' seeds, pods, pollen & all; within a certain temperature range, in glass vats, not heated, in a darkened environment, with specially designed agitating diffusers - from 3 to more than 4 to 8 months respectively. 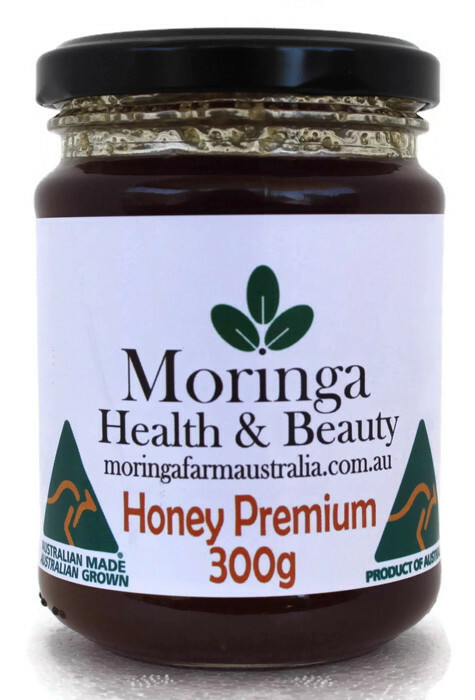 This makes our Moringa honey Phyto-nutrient saturated, Hyper Bioactive & Nutritionally Denser. HERBAL (bio-active) honey is derived by infusing herbal preparations into the honey. "The higher bio-active the herb is, the higher the bio-active amounts are transferred"